Since their formation in April 2013, Police Scotland have blundered from crisis to crisis. That much is, by now, well established. The latest controversy to befall the police force involves allegations that it spied on a journalist without seeking judicial approval. In the face of mounting evidence, a number of prominent Scottish journalists and their union, the NUJ, have urged individuals to send Subject Access Requests to the force. These requests oblige public bodies, under the terms of the Data Protection Act (DPA), to release personal information held on their systems to the individual concerned. Similar requests to forces in England – particularly the Met – have been documented by the Guardian in recent years, and helped reveal the extent to which activists – who’ve frequently never been arrested or charged with any crimes – are being monitored. A Thousand Flowers can now reveal that Police Scotland are evading their legal obligations under the act, and hiding behind a loophole which exempts them from disclosing information held for “policing purposes”. It remains unclear why the police would hold any information on their systems if not for “policing purposes”, given that they are the er, police. Over the past 18 months, identical requests were sent to the Freedom of Information departments at both the Metropolitan Police and Police Scotland, by an individual in Glasgow. 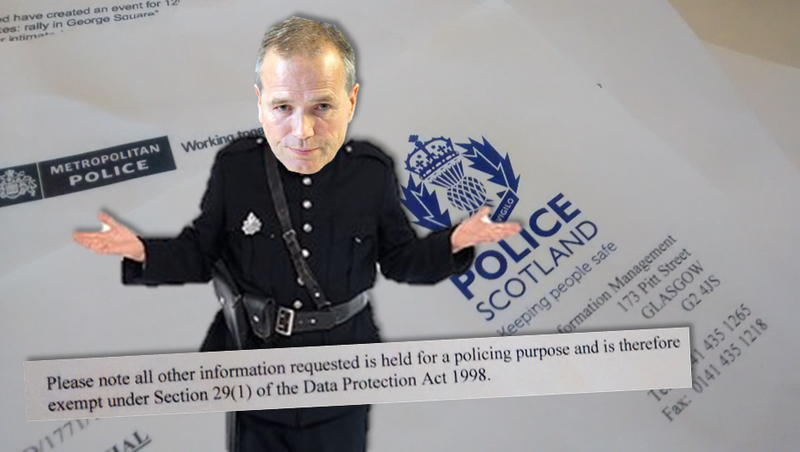 The documents returned by both forces have been viewed by A Thousand Flowers and appear to show that, in contrast to the Met, Police Scotland are shirking their legal obligation to reveal what personal information they are holding. While The Met took nearly 9 months to respond, much longer than the supposed 40 day legal limit, they eventually disclosed a relatively detailed breakdown of information. This means we can reveal – for the first time – that the Met’s elite anti-terror unit – SO15 – were monitoring the activities of student activists in Glasgow in summer 2011, including those at the Free Hetherington occupation. The documents received include a transcript of a Facebook event for a rally to support striking civil servants in June of that year, and describe the individual concerned as a “well documented left-wing activist”. It states that “a number of attendees” at the strike rally have been “involved in recent left-wing student protest and disorder.” Two low quality black and white photos of the individual were also included – both of which appear to have been sourced through social media before being stored on the police database. In contrast, Police Scotland – who unlike the Met did reply within the statutory 40 days – refused to disclose anything more than a print out of the individual’s criminal history. No documentation relating to police investigations or online monitoring was offered, despite clearly falling within the terms of the Subject Access Request. Given the blundering nature of their Kelvingrove “riot” arrest spree/vendetta against student activists – as we exposed here – it’s highly likely that the force were collating similar data to the Met. But we may never know. As revelations continue to emerge about Police Scotland – from the Sheku Bayoh case to the stop and search scandal – what’s become evident is theculture of secrecy and unaccountability that runs right to the top of the organisation. When even the Met – hardly a bastion of liberal values – are doing better than them in fulfilling their DPA obligations, it’s little surprise that public confidence in Scotland’s police is so low. We would encourage everyone – journalists and activists alike – to send Subject Access Requests to both the Met (see here) and Police Scotland (see here) – and we’d be interested to hear if they bother replying with anything substantial. Who called the armed police?